Welcome to Xtra Chalet Champs Avalins! Apart from the advantages of the excellent location at the foot of Val d’Isère’s La Daille slopes, you are assured a genuinely warm welcome from our team of friendly staff, led by an experienced Manager. In common with the rest of Val d’Isère’s La Daille area, the chalet might not win any awards for the cutest or prettiest exterior in the Alps, but as with all properties, it is the location that really counts! And that’s where the Champs Avalins really scores. You can ski back to within just 50m of the chalet, and each morning you have a choice of lifts right on hand to whisk you up the mountain. Inside, the Champs Avalins offers a comfortable and welcoming atmosphere. The attractive restaurant on the first floor has views to the piste, and forms the centrepiece of our chalet, setting the scene for our Xtra Chalet catering. Start the day with a full breakfast including cooked and continental options, whilst Afternoon Tea offers a selection of freshly made cakes and a savoury option. Evening meals start with a glass of Prosecco, followed by an appetiser, main course and a choice of cheese or dessert to finish your meal. Families staying in our ‘Xtra-Chalets’ can chose for children to have High Tea at 5.30 or all dine together at a later time. Any child who received a child discount pays the meal upgrade price of £39. 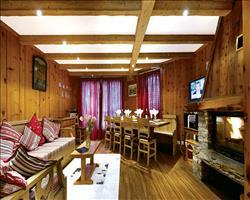 We update Chalet Champs Avalins's details often, but facilities do change. e.g. some extras listed by the supplier as "free" or included might only be for the first time you use them, or for one time per party, then charged for further use. If any specific feature is essential to your holiday, make sure you ask us to confirm the details of it before you book your holiday. Val d'Isere lift pass price last reported as €294 (adult 6 day). 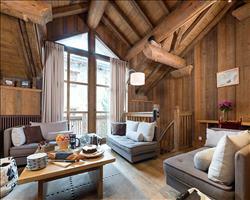 Ask for a quote when booking Chalet Champs Avalins. 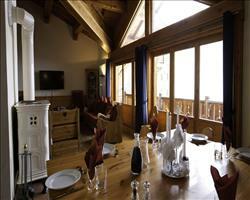 Chalet La Face Val d'Isere France, Gatwick to Chambéry 15th March. 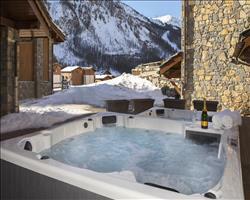 Chalet La Belle E... Val d'Isere France, Gatwick to Chambéry 15th December. 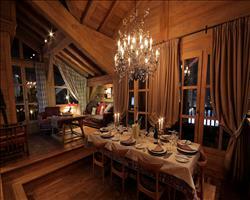 Chalet Bonneval Val d'Isere France, Stansted to Chambéry 15th December. "Chalet a bit aged but no complaints"
Holiday here was really good – it snowed every night and we even had a couple of days of clear skies. The food was pretty good and although it was an old chalet, the experience was decent. 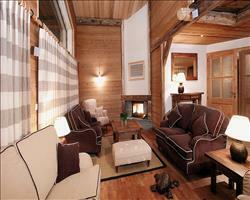 The location of the chalet was pretty decent, next to the stair lift and you could get the ski lift into town. "You get a lot for the price here"
I thought that the Champs Avalins was excellent, I have stayed in more luxurious places but for what you pay you get a lot here. The location is fantastic! It’s on the outside of Val d’Isere, about 5 minutes from the centre. In terms of access to the mountains it’s excellent as you have funicular access to take you into Tignes or Val d‘Isere. The only issue I had – really nitpicking – was that there are so many people staying here that they had two sittings for every meal. Other than that I was thoroughly impressed with the staff and the food. The wines were good, and every evening meal we had was a nice meal. Bedrooms were a bit basic but that’s what you expect of a skiing holiday – and they were comfortable enough. We utilised the facilities. It’s quite a large place with a lot of people staying there, and there wasn’t a lot of space in the bar area for everyone. They could have expanded it if they wanted to by knocking down a couple of walls. However you do have access to a couple of bars in the immediate locale, and it’s only a five minute bus ride to Val d’Isere for more bars. You couldn’t have sat in the restaurant area because the meals didn’t finish until 11pm. This didn’t really affect us as the snow conditions were good so we didn’t want to do too much after skiing all day! "I've already been recommending it!" We had an excellent week and thought the chalet was very good. I’ve already recommended it to many friends, although I’ve suggested not going during February (we went during peak season so it was a bit on the expensive side). The accommodation was nice and clean and the staff were very hospitable. The food was very good, my only comment is that we had to have split eating times because the dining area could only seat 40 while the chalet hotel slept 80. When we asked if we could have the earlier sitting they catered to us very well, it’s just something that would be useful to know in advance. The location was absolutely fantastic as it only took five minutes to walk to the up lift and we never had to queue. Getting the bus into town was also really straight forward. "3rd stay in Chaps Avalins"
This was the third time we’d stayed in the Champs Avalins, and we’ve already booked it for next season. The rooms do need a bit of refurbishing (e.g. the curtains had become quite ragged). There wasn’t a hair dryer in the room either, but as soon as we asked at reception we got one straight away. The food etc was excellent, and the staff were superb. The situation/location is brilliant – we never had to wait for the bus service, and we were steps away from the lifts. For the food, staff and location I would give it a 5, though some people might want to have TV’s and telephones they’re not really for us anyway. We love it! We had a very good Christmas here – the Chalet Hotel itself was OK, and good value for money. The staff were really nice. I think the main criticism I’d have would be that they tried too hard with the food, trying to make it fancy when they weren’t really good enough to pull it off. For example, when the menu said ‘potato fondant’, you were served a boiled potato… The Christmas dinner was fantastic because it was just good solid food, not trying to be anything special. For what we paid, the dining area and bedrooms were fine. Location is spot on – the funicular is right there, so we could catch the first one up at 9am, then ski back down at dusk. This isn’t a ski in, ski out hotel, but it’s pretty close. 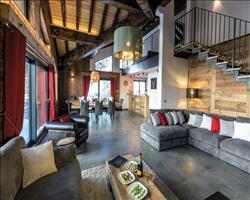 La Daille is quiet but fine, and you can reach Val d’isere centre in a 2-5 minute bus ride. Our stay here was pretty good - we had good transfers in nice coaches. 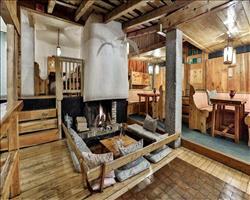 Inside the chalet was very tired, it needs some money spending on it. Everything was clean but the room was basic, the decor etc. made it one of the poorest we had stayed in for a while. Meals were pretty good, there was always something hot in the morning for breakfast like an omelette or bacon sandwich as well as the usual continental stuff. They served cakes in the afternoon and the evening meal was cooked on the day – we chose what we were having the night before. The dining room was quite small so they had to have 2 sittings, which was a bit late for my daughter but otherwise ok. It has a good location 100-150m from the lift and you can ski right back to the doorstep, there’s a little supermarket right next door too. We’d been to Val d’Isere before, it has plenty of skiing and variety in a big ski area. The snow was pretty good and the resort wasn’t as busy as expected at half term as you could drop down to Tignes for more skiing. Great food and lots of wine! The meal times were good – it was just me and my partner and we liked the social aspect as they mix you around lots with the other guests. There are several access points to the slopes; the one we used was 100m away. There are also 3 buses which stop outside all day, so it’s easy to get to the town. We booked very last minute and got a great price. Only skied in Bulgaria before and Val d’Isere was a hell of a lot better! "A good last minute booking"
Room was a little dated, but the representatives were fantastic. This is the very first hotel on the right hand side as you come into Val d’Isere, so you have to get a bus into town – but it was fine for us as a last minute holiday. The food was fantastic, this was the first time for us that we’ve had tea and cake when we come in after skiing. The breakfasts were lovely too. "Repeat guests of the Champs Avalins"
The Chalet Hotel Champs Avalins is brilliant – it was my third stay here and my husband’s fourth, and we’d stay here again. This time round we hadn’t been for a couple of years, but it was nice to go back as we knew what to expect. One thing we like about it is the location, people think it’s out of the way in Le Daille but actually the bus service is so good that you’re not far from anything… and it’s also possible to ski down. The Champs Avalins has all the facilities you need, there isn’t much communal seating, but we don’t tend to need that anyway as we usually go out. The dining room isn’t big enough to seat all the guests so they have two different sittings for dinner (the early one’s a bit early, and the late one’s a bit late – but you get to choose which you prefer). 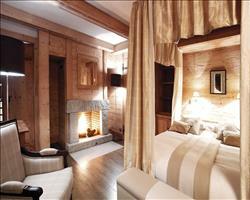 Bedrooms are perfectly adequate, though I always say chalet bedrooms could do with more hooks! "Good chalet in La Daille"
The chalet was good and the staff were very friendly, helpful and accommodating if we needed anything. The food was ok, not fantastic but it certainly did the job (we had a couple of vegetarians in our group and the vegetarian food wasn’t anything special). 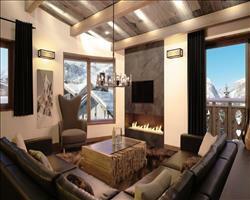 The rooms were good, it’s only a 3 star chalet so it’s never going to be top notch but we got what we paid for. The WiFi was pretty rubbish and the bar downstairs is alright but not the most comfortable bar in the world… I thought the prices would be cheaper than in resort but they weren’t really any different. As long as you’re aware that this is La Daille and not the centre of Val d’Isere, it’s a good location. There’s only a small supermarket in La Daille, if you wanted more shopping you’d have to go into Val d’Isere, there aren’t any bars either but we have young kids so this wasn’t a problem. Getting around La Daille itself is a doddle as is getting on the bus or taking the first lifts. "CH Champs Avalins feb 2016"
This Chalet Hotel is perfectly comfortable, not the best place we’ve been but certainly not the worst. For what we paid it was fine. The food was reasonable, though breakfasts were a bit of a pain - they didn’t have enough tables for everyone so had to do 2 sittings, so you might come down in the morning and not be able to get a seat. That wasn’t the main problem though, it was things like there being no coffee cups left. People were always in a rush to get out and they just needed to be more efficient. Our bedroom was a bit tired, and one bathroom had mould all over the ceiling. My main gripe is that there weren’t enough hooks – when you’re skiing you always need hooks as you have so much stuff to hang up. The amount of space in the cupboards and wardrobes was fine though. I wouldn’t say the chalet hotel is ski in, ski out, but it’s as close as you can get. We had a good Christmas here. The staff and hosts were very good. The hotel is tired but we weren’t surprised by that – the brochure is reasonably accurate. It’s just an older building – probably built in the 70’s… And not much has changed since. For example, electric sockets were hanging off walls and some of it looked like it wasn’t very clean, which wasn’t a reflection on the staff but more the age of it. Everything else about it was good – the location is fantastic - it was just tired. But we got what we were expecting and didn’t feel misled at all. It reflected the price we paid and when you consider how much it costs it’s fine. "Best value slopeside chalet hotel bar none"
Whilst perhaps lacking some of the rustic aesthetics of the smaller chalets in Val, this superb chalet-hotel more than makes up for this with its fantastic location. Located in La Daille, the main village is only a five minute bus ride away, and you can ski back to within 50m of the hotel at the end of the day, but that's not the best of it! You can almost fall into the La Daille gondola when you leave in the morning, and the slopes of Tignes are only two lifts away. It’s the "perfect" base for those looking to make the most of the entire Espace Killy ski area, and what’s more, the infamous Folie Douce mountain club is conveniently located just up the mountain on your last run home! No the most salubrious of chalets, but you simply can't get better value for such a slopeside location in the world's top ski resort! "For the money we paid for it, it was really good"
The food and the staff were really good. It’s not luxury but it was good value. I wouldn’t have been happy if I had paid a high price, but as it was I was happy. The staff did such a good job, they really made it. It was a bit of a pain that they had to have two sittings for dinner (one at 6:30 and one at 8:30) – the first sitting was a bit too early and the second one you ended up having to wait a long time for something to eat in the evening. They needed a little more space really. The bar area is very, very small, as is the boot room (the smallest I’ve ever seen). During the welcome meet people were having to stand on the stairs because the bar area was so small. The drinks at the hotel bar were a bit expensive too. There is a complex with some bars nearby and I wish we had realised this earlier, we didn’t really get to go to them because we only discovered them at the end of the holiday. One of the bars was overlooking the slopes as well. Our room was ok. It was at the back overlooking the piste and the drone of the snow cannons was difficult to sleep through at night. The free wine at dinner was very good and I needed it to get to sleep! The hotel’s location was really great. You just had to walk past the complex with the bars and the supermarket and you were at the slopes, about 250 yards walk. It’s not in the main part of the resort, but you can take the bus up to the resort and the bus is brilliant, it runs all night. You can ski back down into the resort and the runs over at the chalet hotel are easier to ski down at the end of the day than the two main ones that take you back into the main town. You can also take the funicular back down to the hotel.